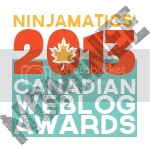 Spydergrrl on the Web Receives Its 4th Nomination for a Canadian Weblog Award! Apparently, I have at least three readers. Who cares? What is CWA? The Canadian Weblog Awards is a pretty neat competition: it's not one of those popularity "please-vote-for-me-once-a-day-for-the-rest-of-your-life" competitions. Nay, it has zero public voting and is adjudicated by a panel of judges. And all of the blogs are Canadian. We have a lot of talent up here. We're a talented lot, we Canadians, and we should show it off. We deserve it. How DO They Pick Winners? There is no system of public voting in the Canadian Weblog Awards. The Canadian Weblog Awards are instead judged by a volunteer jury of both bloggers and blog enthusiasts using the following criteria. This way, each of the weblogs is judged by its quality, not its popularity. The jury uses a number system to value the criteria and weight their decisions. The weblogs in each category will be judged against two divisions of elements: Design and Content. Each division's elements will be awarded 0 to 2 points — 0 if the element is poorly executed, 1 if the element is average, and 2 if it is excellent — for a possible perfect mark of 20 points. Did you notice that second-last one? Yeah, that's @RobWoodbridge's site -- if you have been to one of the last 3 UXCamp Ottawa conferences, then you might remember him as the World's Best MC. So... yeah, tough competition. Regardless, I'm thrilled to be in such wonderful company. The top three in each category will be declared on December 1st and then finalists will be declared on December 7th. While we wait, I suggest you go take a look at those other sites and update your RSS readers with some pretty awesome CanCon.